The genes encoding key enzymes in the biosynthetic pathway of terpenoids in T. wilfordii have already been cloned and identified.,,,,,,, The biosynthetic pathway consists of an upstream isoprenoid pathway, in which two common C5 building blocks, isopentenyl diphosphate (IPP) and dimethylallyl diphosphate, are formed through either the cytoplasmic mevalonate or the plastidic 2-C-methyl-D-erythritol-4-phosphate pathway, then prenyltransferase-catalyzed condensations of these two C5 units, result in the formation of linear elongated prenyldiphosphates including the C10 monoterpene precursor geranyl diphosphate, the C30 triterpene (e.g., celastrol) precursor farnesyl diphosphate (FPP), and the C20 diterpene (e.g., triptolide) precursor geranylgeranyl diphosphate. However, little is known about the terpenoid bypass metabolic pathway. Based on this knowledge, we identified two dehydrodolichyl diphosphate synthase (DHDDS) genes from T. wilfordii by analyzing transcriptome data. 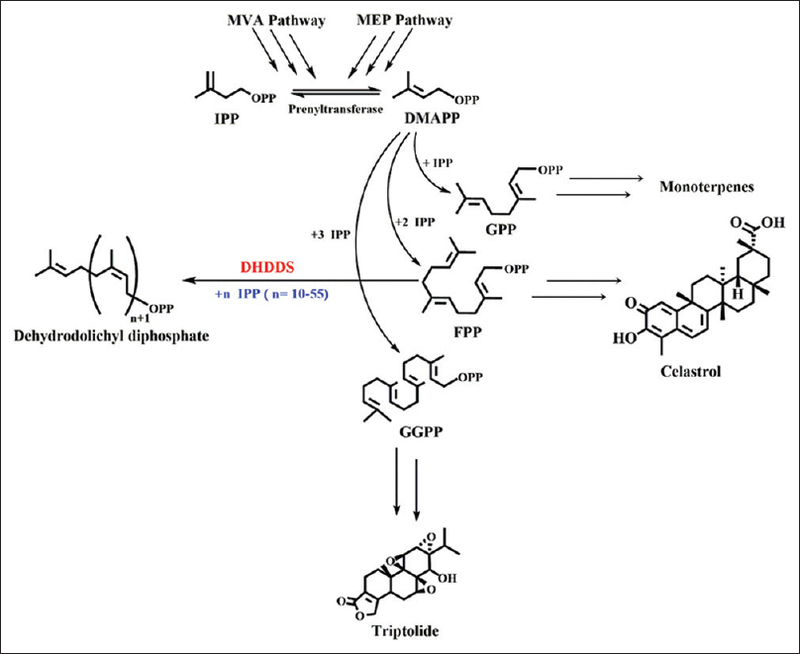 DHDDS participates in the terpenoid bypass metabolic pathway, where it continuously condensates FPP with multiple IPP units to generate dehydrodolichyl diphosphate (dedol-PP) which is the precursor of dolichol [Figure 1]. Dolichol has a long chain composed of isopentenyl group and plays an important role in the process of glycosylation as a glycosyl carrier. In this study, two TwDHDDS genes were cloned and investigated by bioinformatics and tissue expression analysis. The data enrich our knowledge of the terpenoid bypass metabolic pathway of T. wilfordii and provide genetic targets for the subsequent use of CRISPR-Cas9 gene editing technology to eliminate bypass genes or inhibit terpenoid bypass metabolic pathways to increase the metabolic flux toward the synthesis of valuable bioactive terpenoids such as triptolide. Whole plants of T. wilfordii Hook F were obtained from the experimental fields of Fujian Agriculture and Forestry University (Fujian Province, China). Fresh leaves, stems, roots, and flowers were cleaned and stored at −80°C. The total RNA of different tissues of T. wilfordii was extracted using the cetyltrimethylammonium bromide method  and purified by RNA Purification Kit (TransGen Biotech, Beijing, China). The concentration of RNA was measured using a NanaDrop 2000 nucleic acid/protein quantifier (Thermo Scientific, USA). The extracted RNA was converted to first-strand cDNA templates using the FastKing RT Kit (Tiangen Biotech, Beijing, China). Specific primers [Table 1] were designed based on sequences in the T. wilfordii transcriptome database. The 50 μL reaction mixtures comprised 25 μL Phusion HF MM (New England Biolabs, USA), 2.5 μL (10 μM) each of the forward and reverse primers, 1 μL cDNA, and 19 μL ddH2O. The primers and polymerase chain reaction (PCR) conditions are listed in [Table 1]. The PCR product was purified and cloned into the pEASY-T3 vector (TransGen Biotech) and transformed into Escherichia coli Trans 5α competent cells (TransGen Biotech). Positive clones were selected and sequenced to obtain the TwDHDDS gene sequence. Primer synthesis and sequencing was conducted by Shanghai Majorbio Bio-pharm Technology Co., ltd., PR China. 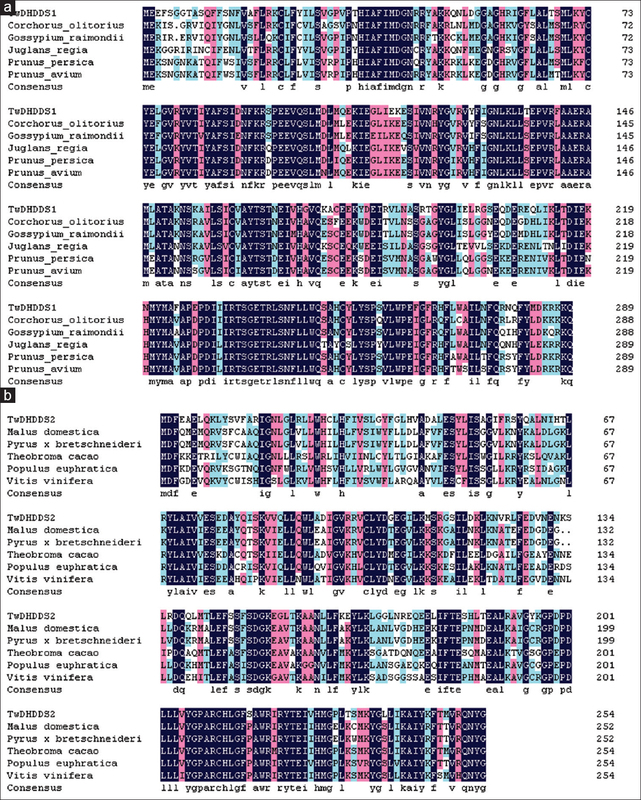 The open reading frames (ORFs) were identified using ORF Finder (https://www.ncbi.nlm.nih.gov/orffinder) to obtain the protein sequences, which were compared with those from other species using NCBI (https://blast.ncbi.nlm.nih.gov/Blast.cgi), and the protein sequences of other species were downloaded. Multiple sequence alignments were performed using DNAMAN software is DNAMAN V6 software (Lynnon Biosoft, Quebec, QC, Canada) and the phylogenetic tree was constructed using molecular evolutionary genetics analysis (MEGA 6.0) software  based on the results of the homology comparison. Interpro (http://www.ebi.ac.uk/interpro) was used to identify functional domains. The theoretical isoelectric point (pI) and molecular weight (Mw) were determined using the Compute pI/Mw tool (https://web.expasy.org/compute_pi/). The TargetP 1.1 server (http://www.cbs.dtu.dk/services/TargetP/) was used to analyze signal peptides. Subcellular localization was analyzed using Psort (http://psort1.hgc.jp/form.html). Transmembrane domains were analyzed using TMHMM server v2.0 (http://www.cbs.dtu. dk/services/TMHMM/). PredictProtein (http://www.predictprotein.org) was used to predict the secondary structure of the proteins. The 3D structure homology models were built using SWISS-MODEL (https://www.swissmodel.expasy.org/interactive). The eukaryotic translation elongation factor 1α (Ef1α) gene was used as an endogenous control to normalize the expression level. The specific primers for quantitative real-time (qRT) PCR were designed according to the TwDHDDS sequence [Table 1]. The 10 μL reaction mixes comprised 5 μL qPCR SuperMix (TransGen Biotech), 0.2 μL (10 μM) each of the forward and reverse primers, 1 μL cDNA, and 3.6 μL ddH2O, and the reactions were performed on a Roche LightCycler 480 Real-Time PCR System (Roche, Switzerland). PCR conditions are listed in [Table 1]. The expression of TwDHDDS was evaluated using the 2−ΔΔCt method  with triplicate measurements based on three biological replicates. The error was estimated by evaluating the 2−ΔΔCt term using ΔΔCt + standard deviation and ΔΔCt − standard deviation. The full-length cDNA sequences of TwDHDDS1 and TwDHDDS 2 were obtained through RT-PCR with specific primers [Figure 2]. TwDHDDS1 (GenBank accession number: MG787474) encodes a protein of 290 amino acids with high sequence identity (78%) with known DHDDS from Corchorus olitorius and Gossypium raimondii. TwDHDDS2 (GenBank accession number: MG7874745) encodes a protein of 255 amino acids, which is 66% identical to the DHDDS from Malus domestica and Pyrusx bretschneideri [Figure 3] and [Table 2]. 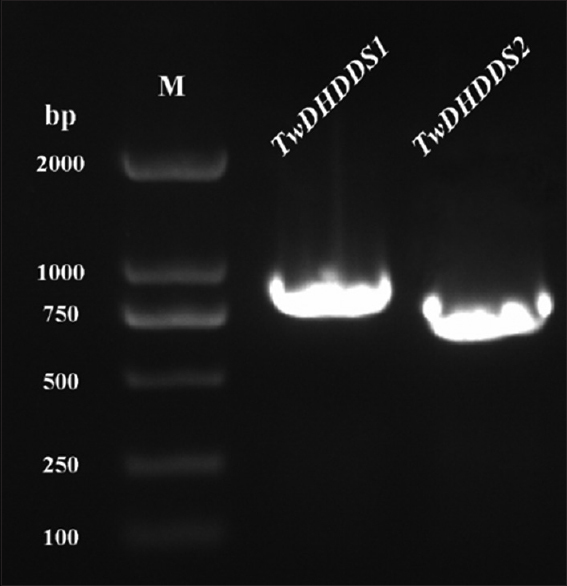 The domain analysis conducted using InterPro showed that TwDHDDS1 and TwDHDDS2 share a conserved domain, in which TwDHDDS1 has a conserved site of polyprenyltransferase activity. Sequence divergences were calculated using the Kimura two-parameter (K2P) distance model. A neighbor-joining tree was created using the MEGA software to evaluate the homology of the DHDDS sequences [Figure 4]. Bootstrapping was performed with 1000 replications and was reported as percentages. 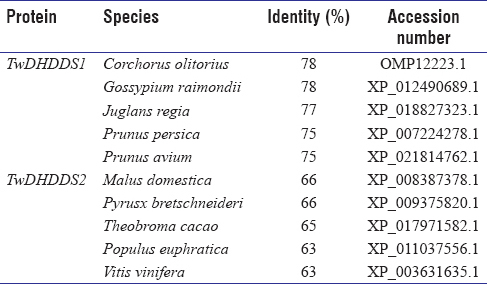 The results showed that TwDHDDS1 shared more identity with the DHDDS from C. olitorius, Durio zibethinus, and G. raimondii, which clustered into one clade. By contrast, TwDHDDS2 clustered close to the dehydrodolichyl diphosphate synthase complex subunit NUS1 sequences from Carica papaya, Vitis vinifera, and Populus euphratica, indicating that TwDHDDS2 and dehydrodolichyl diphosphate synthase complex subunit NUS1 have a closer genetic relationship. The calculated Mw of TwDHDDS1 was 33.46 kDa, and the predicted pI was 8.67. TwDHDDS1 is a secretory protein with a signal peptide, predicted to be localized to microbody. The results of transmembrane domain analysis showed that the amino acids 18–44 and 61–83 were located in the transmembrane region. The results of the secondary structure prediction showed a predominantly helix and loop structure, with 54.5% α-helices and 35.2% loops and 10.3% β-strands. Using the structure 2 vg3.1.B as a template for homology modeling, a 3D structure was generated [Figure 5]a, with 27.87% identity. The calculated Mw of TwDHDDS2 was 29.19 kDa, and the predicted pI was 7.72. TwDHDDS2 is also a secretory protein with a signal peptide and was also predicted to be localized to microbody. However, transmembrane domain analysis showed that the TwDHDDS2 protein does not have a transmembrane region. The results of secondary structure prediction showed a predominantly α-helical structure, with 71% α-helices, 20.4% loops, and 8.6% β-strands. Using 3wyi. 1.A as a template for homology modeling, 3D structure was generated [Figure 5]b, with 18.97% identity. To investigate the physiological roles of TwDHDDS1 and TwDHDDS2 in T. wilfordii, we performed qRT-PCR to evaluate the corresponding mRNA levels in various organs including root, stem, leaf, and flower. The results showed that TwDHDDS1 and TwDHDDS2 were expressed practically ubiquitously in all sampled organ tissues, with the highest transcription levels in stems [Figure 6]. DHDDS are conserved and widespread in a variety of organisms including yeasts, bacteria, animals, and plants.,,, They belong to the isopentenyl transferase family and can be subdivided into different classes according to the structural features of their respective substrates and products such as cis or trans structure and the number of carbon atoms. 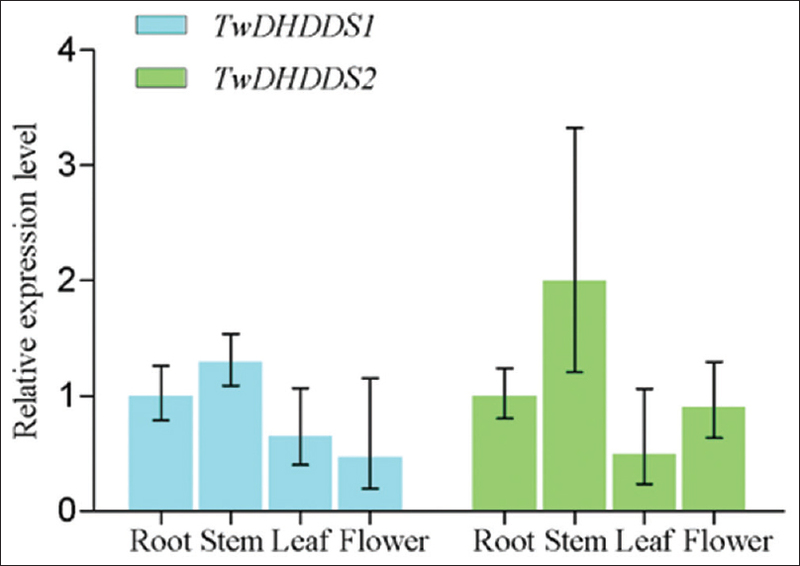 The tissue expression analysis revealed that both TwDHDDS1 and TwDHDDS2 were expressed practically ubiquitously in all sampled organ tissues, and showed the highest transcription levels in stems which was different from the expression pattern of Arabidopsis thaliana DHDDS gene. These results suggested that stem tissues need an more abundant supply of dedol-PP to sustain an active synthesis of dolichol. The results of BLAST and phylogenetic tree analysis showed that TwDHDDS1 had a close genetic relationship with dehydrodolichyl diphosphate synthases from other species, while TwDHDDS2 and the dehydrodolichyl diphosphate synthase NUS1 subunit had a closer genetic relationship. Hence, this study provides the basis for further functional investigations of TwDHDDS1 and TwDHDDS2. FPP and IPP are important precursors of monoterpenes, sesquiterpenes, diterpenes (e.g., triptolide), and triterpenes (e.g., celastrol)., DHDDS can continuously condense FPP and multiple IPP units to produce dehydrodolichyl diphosphate and the biosynthesis of dolichol will competitively consume these precursors. The genes encoding key enzymes in the upstream biosynthetic pathways of triptolide and celastrol have already been cloned and identified and the accumulation of triptolide and celastrol can be directly increased by overexpressing the key enzymes involved in the upstream pathway through genetic manipulation. Here, two TwDHDDS genes involved in the dolichol synthetic pathway were cloned and studied, enriching our knowledge of the T. wilfordii terpenoid bypass pathway. The blockage of this synthetic pathway by CRISPR-Cas9-based genome editing can provide a new strategy to improve the production of important bioactive terpenoids. This work was supported by the National Natural Science Foundation of China (81773830 to W.G. ), High-level Teachers in Beijing Municipal Universities in the Period of 13th Five-year Plan (CIT&TCD20170324 to W.G.) and Key project at central government level: The ability establishment of sustainable use for valuable Chinese medicine resources (2060302 to L.H.). Gao W, Liu MT, Cheng QQ, Pan GF, Wang XJ. Herbal textual research on Tripterygium wilfordii. World J Tradit Chin Med 2012;7:560-2. Manzo SG, Zhou ZL, Wang YQ, Marinello J, He JX, Li YC, et al. Natural product triptolide mediates cancer cell death by triggering CDK7-dependent degradation of RNA polymerase II. Cancer Res 2012;72:5363-73. Titov DV, Gilman B, He QL, Bhat S, Low WK, Dang Y, et al. XPB, a subunit of TFIIH, is a target of the natural product triptolide. Nat Chem Biol 2011;7:182-8. Chugh R, Sangwan V, Patil SP, Dudeja V, Dawra RK, Banerjee S, et al. Apreclinical evaluation of minnelide as a therapeutic agent against pancreatic cancer. Sci Transl Med 2012;4:156ra139. Chou CT. The antiinflammatory effect of an extract of Tripterygium wilfordii Hook F on adjuvant-induced paw edema in rats and inflammatory mediators release. Phytother Res 2015;11:152-4. Ma J, Dey M, Yang H, Poulev A, Pouleva R, Dorn R, et al. Anti-inflammatory and immunosuppressive compounds from Tripterygium wilfordii. Phytochemistry 2007;68:1172-8. Goldbach-Mansky R, Wilson M, Fleischmann R, Olsen N, Silverfield J, Kempf P, et al. Comparison of Tripterygium wilfordii Hook F versus sulfasalazine in the treatment of rheumatoid arthritis: A randomized trial. Ann Intern Med 2009;151:229-40. Liu J, Lee J, Salazar Hernandez MA, Mazitschek R, Ozcan U. Treatment of obesity with celastrol. Cell 2015;161:999-1011. Luo XL, Shao Q, Qu HB, Cheng YY. Simple method for determination of five terpenoids from different parts of Tripterygium wilfordii and its preparations by HPLC coupled with evaporative light scattering detection. J Sep Sci 2007;30:1284-91. Galanie S, Thodey K, Trenchard IJ, Filsinger Interrante M, Smolke CD. Complete biosynthesis of opioids in yeast. Science 2015;349:1095-100. Lau W, Sattely ES. Six enzymes from mayapple that complete the biosynthetic pathway to the etoposide aglycone. Science 2015;349:1224-8. Huang LQ, Gao W, Zhou YJ. Application of synthetic biology to sustainable utilization of Chinese materia medica resources. Yao Xue Xue Bao 2014;49:37-43. Liu YJ, Zhao YJ, Zhang M, Su P, Wang XJ, Zhang XN, et al. Cloning and characterisation of the gene encoding 3-hydroxy-3-methylglutaryl-coA synthase in Tripterygium wilfordii. Molecules 2014;19:19696-707. Tong Y, Su P, Zhao Y, Zhang M, Wang X, Liu Y, et al. Molecular cloning and characterization of DXS and DXR genes in the terpenoid biosynthetic pathway of Tripterygium wilfordii. Int J Mol Sci 2015;16:25516-35. Tong Y, Zhang M, Su P, Zhao Y, Wang X, Zhang X, et al. Cloning and functional characterization of an isopentenyl diphosphate isomerase gene from Tripterygium wilfordii. Biotechnol Appl Biochem 2016;63:863-9. Liu YJ, Zhao YJ, Su P, Zhang M, Tong YR, Hu TY, et al. The MVA pathway genes expressions and accumulation of celastrol in Tripterygium wilfordii suspension cells in response to methyl jasmonate treatment. J Asian Nat Prod Res 2016;18:619-28. Zhao YJ, Chen X, Zhang M, Su P, Liu YJ, Tong YR, et al. Molecular Cloning and Characterisation of Farnesyl Pyrophosphate Synthase from Tripterygium wilfordii. PLoS One 2015;10:e0125415. Zhang M, Su P, Zhou YJ, Wang XJ, Zhao YJ, Liu YJ, et al. Identification of geranylgeranyl diphosphate synthase genes from Tripterygium wilfordii. Plant Cell Rep 2015;34:2179-88. Su P, Hu T, Liu Y, Tong Y, Guan H, Zhang Y, et al. Functional characterization of NES and GES responsible for the biosynthesis of (E)-nerolidol and (E, E)-geranyllinalool in Tripterygium wilfordii. Sci Rep 2017;7:40851. Su P, Guan H, Zhao Y, Tong Y, Xu M, Zhang Y, et al. Identification and functional characterization of diterpene synthases for triptolide biosynthesis from Tripterygium wilfordii. Plant J 2018;93:50-65. Laule O, Fürholz A, Chang HS, Zhu T, Wang X, Heifetz PB, et al. Crosstalk between cytosolic and plastidial pathways of isoprenoid biosynthesis in Arabidopsis thaliana. Proc Natl Acad Sci U S A 2003;100:6866-71. Sakaihara T, Honda A, Tateyama S, Sagami H. Subcellular fractionation of polyprenyl diphosphate synthase activities responsible for the syntheses of polyprenols and dolichols in spinach leaves. J Biochem 2000;128:1073-8. Del Sal G, Manfioletti G, Schneider C. The CTAB-DNA precipitation method: A common mini-scale preparation of template DNA from phagemids, phages or plasmids suitable for sequencing. Biotechniques 1989;7:514-20. Livak KJ, Schmittgen TD. Analysis of relative gene expression data using real-time quantitative PCR and the 2(-delta delta C(T)) method. Methods 2001;25:402-8. Cunillera N, Arró M, Forés O, Manzano D, Ferrer A. Characterization of dehydrodolichyl diphosphate synthase of Arabidopsis thaliana, a key enzyme in dolichol biosynthesis. FEBS Lett 2000;477:170-4. Zhang H, Li ZX.In vitro and in vivo characterization of a novel insect decaprenyl diphosphate synthase: A two-major step catalytic mechanism is proposed. Biochem Biophys Res Commun 2013;442:105-11. Sato M, Fujisaki S, Sato K, Nishimura Y, Nakano A. Yeast Saccharomyces cerevisiae has two cis-prenyltransferases with different properties and localizations. Implication for their distinct physiological roles in dolichol synthesis. Genes Cells 2001;6:495-506. Pan YF, Gong YF, Yu K, Zhu SQ, Wang HY. 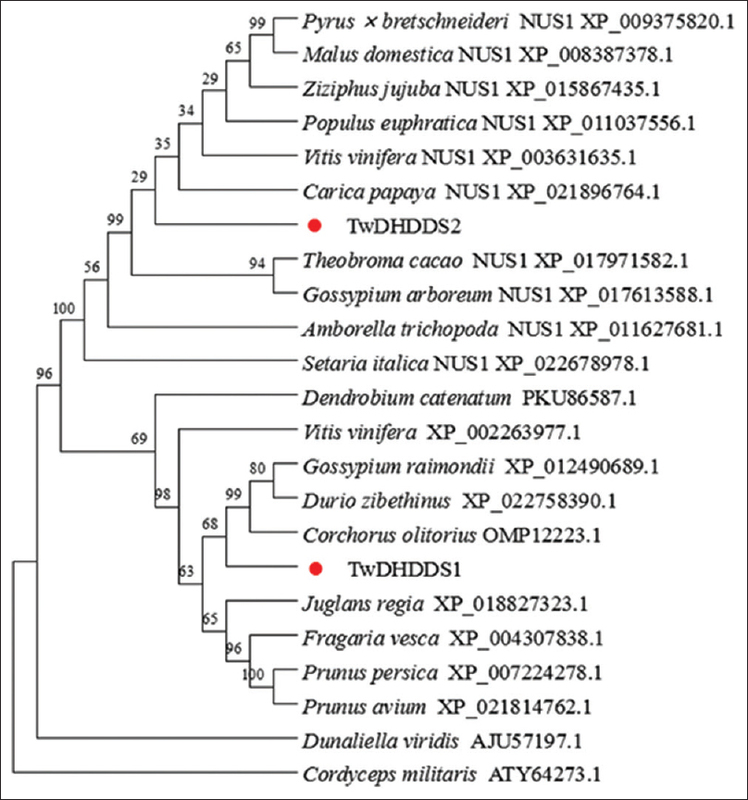 Bioinformatics analysis and expression study of DHDDS of Dunaliella virid. Biotechnol Bull 2015;31:101-8. Bach TJ. Some new aspects of isoprenoid biosynthesis in plants – A review. Lipids 1995;30:191-202. McGarvey DJ, Croteau R. Terpenoid metabolism. Plant Cell 1995;7:1015-26.